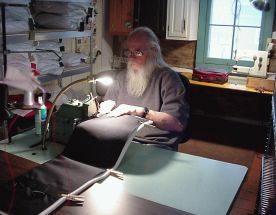 On this page, we would like to talk more specifically about the sewing end of this business and how the bags have become what they are today. 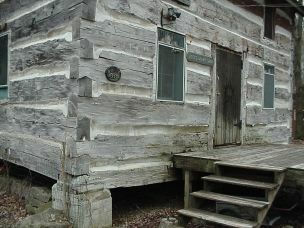 Lee's sewing space is actually a log house on their property that they converted into her "sewing house." 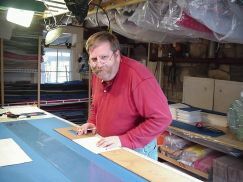 One room has a 4' x 9' cutting board which makes laying out the material easier. 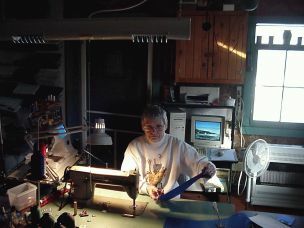 She uses an electric rotary knife to cut multiple layers. 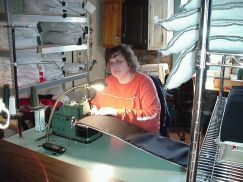 She also has wall and ceiling racks for materials, plus places for industrial and regular sewing and serger machines. Lee's bags have evolved over the years from her basic design to what people have asked for or from suggestions made for improvement. They open at the top with a zipper for easy loading and unloading. The front zippered pocket is large enough for a book of music, sheet music, and all your accoutrements. There is also an attached pick pocket inside. All the bags have a carrying handle, a shoulder strap with a rubber pad, and now we have backpack straps as an option. It takes forty-five pieces of quality material to make a bag. From layout of the material to the final clean up on a standard case, it takes seven hours. The outer shell is made from Dupont Cordura® nylon which is water repellent and resistant to abrasion, fading, rot, and mildew. It is lined with a lightweight foam for insulation and to help keep the shape. The most popular bag is the one that carries two dulcimers. It is only three inches wider than the single bag so it is an easy way to carry two dulcimers and still have a hand free. It is made exactly like the single bag except it has a padded divider to separate the instruments. 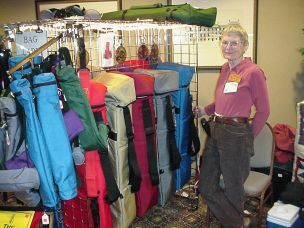 "Mr. & Mrs. Ohio Bag Lady" are at a crossroads in trying to meet demand and still have the time to make a quality product and vendor at festivals, too. One of the solutions to this dilemma has been to involve family. Daughter, Toni and her husband, Steve have been there to pitch in during those pressure times. They have found a niche in the process by helping to cut materials, basic sewing or even shipping products while Lee & Doug are on the road. Thanks for stopping by Lee's Sewing House. We hope to see you at a dulcimer festival soon.